LG has announced the arrival of its latest price of home cinema kit for the Blu-ray market – the HB954SP. 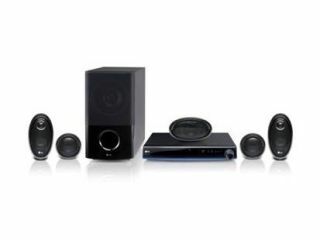 The surround sound system packs five satellite speakers and a subwoofer, and there's also some built-in amplification of 1000W. The HB954SP can also decode high-def audio to improve the experience on your ears. When it comes to decoding, the HB954SP will sort out your Dolby Digital and DTS, and it will also playback Dolby TrueHD and DTS-HD MA. As for the blu-ray system itself it's Profile 2.0, has direct access to YouTube and will upscale standard –def footage to 1080p. Connectivity comes in the form of two HDMI sockets. There's also the addition of a sound gallery, where users can choose from seven options for sound. These include a night mode (or, as we like to call it, 'don't wake the missus' mode) where the bass can be turned off. With pricing to be confirmed, the LG HB954SP has a release date of November. Go to www.lge.com/uk for more details.